I like the composition of this piece…white objects are hard to deal with! I think that I probably left a little too much of the paper in sections, as there is very little in the image that is really that stark. I have another “white” flower in progress… the one with the bee, I may have to abandon this and move on to more color for a little while. I am having trouble with the casein, really need to keep it blocked out more and experiment with laying color blocks and see how drawing over that works out. Right now I have 3 other pieces going and I need to commit to one of them! 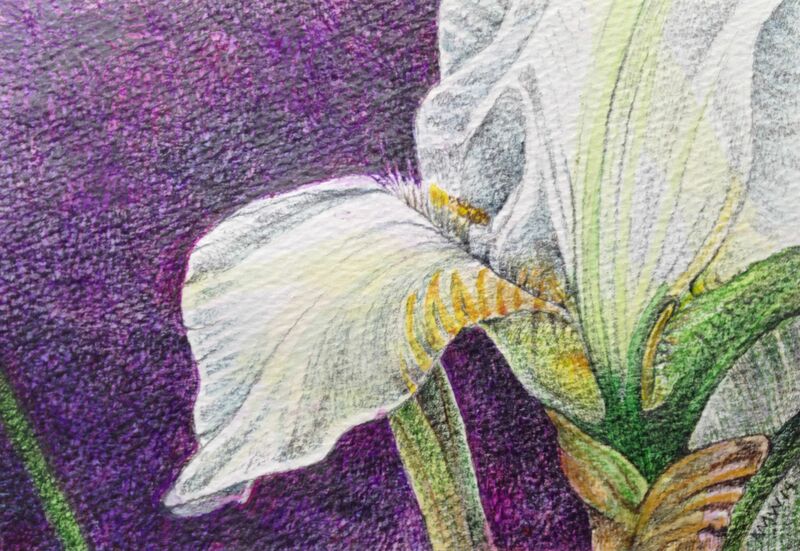 This entry was posted in Uncategorized and tagged colored pencil, graphite, small painting, watercolor, white iris. Bookmark the permalink. It's all very dandy, don't you think? Melissa McKinnon is a Contemporary Canadian Landscape Artist living and painting in Calgary, AB. Economic opportunity for Maine through next generation broadband infrastructure.